We do not know his name, or his age. We do know, thanks to a report in the Waikato Argus, that he and a male companion had left Otahuhu, and had been working their way down the Great South Road. It was the winter of 1913, and there was trouble in Auckland. The men who loaded the ships at the city's port were threatening to strike; the government of William Massey had denounced them as reds and anarchists, and had threatened to send police and soldiers to work the waterfront. On the farms outside Otahuhu men who relied on exported meat for their income discussed cavalry tactics in their cowsheds, and sniped at magpies and pukeko. For anyone who could not afford a train ticket, the Great South Road was the easiest escape route from Auckland. 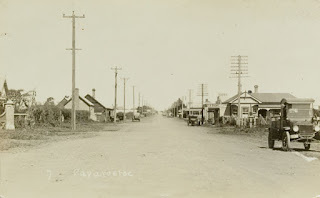 The swagger and his companion walked south, through the village of Woodside, which is today preserved under Manukau City's concrete, through Papakura, where a new post office had just opened, and through Drury, where skinny horses waited patiently on their leashes outside the tavern. At Bombay, just before the road struggled over the Razorback Hills, the swagger and his mate found work for a few days. For decades swaggers had been walking New Zealand's roads. They had an unwritten contract with New Zealand's farmers and country constables. Swaggers were allowed to wander, but forbidden to stay too long in one place without jobs. They could ask for food, for accommodation, and for work, but they could not ask too aggressively. If farmers did not offer a few days' work, then they would usually provide a night's accommodation in a barn or a cowshed or a stable, and a few scraps of food. Swaggers were expected to show their gratefulness for these gifts by chopping some firewood, or by milking a few cows. The pair of swaggers moved on, over the Razorbacks and into the Waikato, where the river and the road ran beside each other, and were both lost in mist for hours each morning. The road was flat again, and still busy, by New Zealand standards. It is easy to imagine a farmer or a hawker pulling up, and offering the swaggers a place on his wagon, amidst the rubble of a potato harvest, or bottles of patent medicine, or leaky sacks of flour. The going should have been easy, but it wasn't. The mornings were cold, but the swagger could not stop sweating. The road was flat, but his calves and shins ached, as though he were still climbing the Razorbacks. He stopped to catch his breath, and found himself kneeling at the edge of a drainage ditch, vomiting up the pumpkin stew or lamb's fry some farmer's wife had spared for him. Going to bed in another barn he felt colder than usual, but hours later woke with his skin on fire. He stripped off his blanket and his stinking clothes, but soon woke again, shivering. Eventually the swagger and his companion were on the brink of Hamilton. Motorcars approached them, like emissaries from the Waikato's largest town. I imagine the swagger's companion stopping, and looking at him queerly. Pebble-sized pustules had grown from the swagger's forehead, from his cheeks. By the time the swagger had reached Victoria Street, with its pubs and cattle drovers holding up motorcars, the boils had spread to his forearms, to his torso. I imagine him breaking one of the growths with a jagged thumbnail: the pus would have been grey, and sticky, and streaked with blood. Hamilton's hospital had been built on the low hill overlooking Rotoroa, the lake soldier-settlers had stocked with swans and ducks and rowboats. The doctors and nurses were used to treating swaggers. Most of their visits went unrecorded, but in 1904 newspapers had discussed the case of an Irish veteran of the New Zealand Wars named Michael Barry, who had arrived at Ohaupo, a small town on the Great South Road just beyond Hamilton, and ordered a beer. Barry could hardly 'walk or breathe', so the hotelier 'served him some schnapps and housed him in the stable'. A constable arrived to take Barry to hospital, and found him in a 'filthy condition'. Barry explained that he hadn't washed for six years; the policeman 'could not approach him without a disinfectant'. Barry was allowed to linger and die in the hospital on the low hill above the ornamental birds and boats. But Dr Hugh Douglas, the chief surgeon and de facto manager of Waikato Hospital, quickly realised that the new swagger was special. He was not sweating and shaking because of delirium tremens or alcohol withdrawal; the marks on his face had not been made by dirt or a fistfight. The swagger had smallpox. There were already half a dozen smallpox victims in a quarantined ward of Waikato hospital, but all of them were Maori, from the village at Maungatautari, twenty or so kilometres away. Dr Douglas had travelled to Maungatautari in July, and watched one of the Ministry of Health's inspectors raise a yellow flag above the kainga. The swagger was the first white victim of the pox to appear in the Waikato. The disease had crossed a racial boundary. [I]t is advisable that no persons who appear suspicious (from a disease point of view) be allowed in your establishment. Will you, therefore, in the case of any person applying for accommodation or meals, or in the case of any lodger who appears 'off colour' in this respect, at once notify [Inspector Bennett]...so that steps may be immediately taken to prevent the disease getting a footing in the town...This particularly refers to that class of person termed 'swaggers', as they are very difficult to keep in touch with. 'Off colour', 'footing': the mayor's words betrayed his anxieties about race and vagrancy. In April 1913 a Mormon missionary named Richard Shumway had arrived in Auckland for a hui organised by New Zealand's Saints. Maori from around the country had to come to korero and hongi with Shumway and other missionaries. Shumway was sweating and sneezing, but he struggled through the hui. He thought he had measles; he was suffering from smallpox. After the hui Maori returned to kainga with Mormon devotional literature, and with a deadly disease. Soon the Ministry of Health's inspectors were isolating the Maori villages on the southern and eastern fringes of Auckland. The yellow flag of quarantine was raised over Mangere and Orakei. Smallpox travelled through the air, and through human fluids. A cough, a kiss, a tear: all were vehicles for the virus. It took about a fortnight for the infected to sicken. At first they might have been suffering from the flu. Then boils, hundreds of them, began to grow, and fill with pus and blood. When the boils burst they left scabs. If the victims lived long enough the scabs would flake off, to revealing pitted scars. By September 1913 a consensus had developed amongst New Zealand's politicians and journalists: smallpox was, in the words of the Dominion, a 'Maori malady', caused by the unhygienic homes and immoral habits of the country's indigent indigenes. If the movements of Maori were not restricted, then they would spread the disease to their white neighbours. Alexander Young, the MP for Waikato, told parliament that it was fortunate smallpox had not broken out in the summer, when the 'flies' and 'crowding' in kainga would have spread it even faster. George Elliott, a businessman organising an international trade fair in Auckland, demanded that 'filthy' Maori settlements like Orakei and Mangere be torched, and called for the deportation of every last Maori from the city. Young and Elliott were not only prejudiced but wrong. When in 1914 Joseph Frengley, New Zealand's National Health Officer, analysed the smallpox epidemic and composed a report for parliament, he was unable to find a link between unsanitary housing and smallpox infection. 'Natives living in comfortable homes' suffered 'as much as the others', Frengley told parliament. If any Maori fell ill, then the Health Department punished his or her kin and kainga with quarantine. Once the yellow flag had been raised over a Maori community, its members were prohibited from travelling, unless they carried a certificate of immunisation. In some places, not even such a certificate would do. The Waikato Hospital Board had insisted that the Maori of Maungatautari could only travel as far as Victoria bridge, which crossed the Waikato River and separated their community from the white town of Cambridge, and that they must carry a yellow flag if they journeyed even this far. An improvised militia waited on the Cambridge bank of the river, ready to enforce the ban with bullets. The Maori of Mangere were forbidden to cross the bridge that crossed the Manukau harbour, and connected their village with Onehunga and the isthmus of Auckland. There was no effective treatment for smallpox, but the first vaccine had been invented at the end of the eighteenth century. 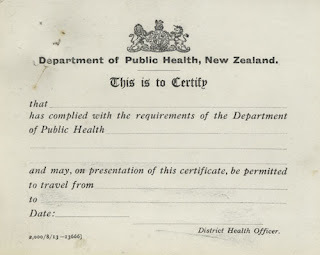 In the late nineteenth and early twentieth centuries New Zealand's government had made some desultory attempts to immunise its people against the disease. By the end of the winter of 1913 demand for vaccination far exceeded supply. 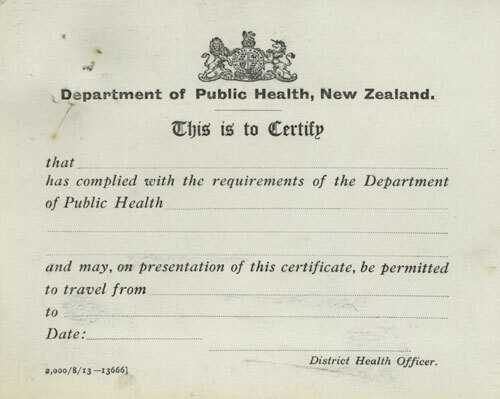 The Ministry of Health and hospital boards tended to vaccinate city dwellers before rural New Zealanders, and whites before Maori. One woman here is just turning the corner after a very severe attack. She was a fine handsome native, and at the worst she was absolutely repulsive, with immense adema of the face, lips, nose and tongue worst...[Her] odour has been almost overpowering and still is offensive. She will be horribly marked. In some communities there was no medical help, only a quarantine enforced by the state and white militia. Isolated from advice about the strange disease, Maori found their own desperate tactics to prevent its spread. In one Northland village an entire family became sick, and eventually died, one by one, in their home. Too afraid to retrieve the bodies and organise a tangi, neighbours set the whare and its decomposing corpses ablaze. While Hugh Douglas was tending to his smallpox victims and Arthur Manning was searching Hamilton's pubs and boarding houses, Health Inspector Bennett was driving slowly up the Great South Road in a government car, with a pair of assistants and a load of formaldehyde. Using a statement that the swagger had given from his hospital bed, Bennett revisited the places that the man and his companion had stayed. He sprayed formaldehyde over barns and cowsheds where the swaggers had slept, burnt any mattresses they had touched, burnt the clothes of anyone unfortunate enough to have shaken the men's hands. Bennett had already sprayed gallons formaldehyde onto Maungatautari, and the Maori village at Whatawhata. In 1913 formaldehyde was commonly used as a decontaminant. The chemical's role in causing cancer was not known until the 1980s. Inspector Bennett was spreading a new disease as he travelled about the Waikato and up the Great South Road. At the beginning of the twentieth century many New Zealanders saw Auckland as a place where disease flared and festered. Auckland was New Zealand's largest port; crews from around the world rioted in its bars and brothels, and left diseases and rats behind when they sailed away past Rangitoto. The working class suburbs that had grown up just west of Auckland were regarded, like the East End of London, as citadels of filth and illness, and the Maori villages on the city's fringe were considered even dirtier and more dangerous. Like the railways, the Great South Road was a route for infection to spread from Auckland to the rest of the country. In 1900 bubonic plague had emerged in Calcutta, and been exported by ships' rats to Noumea and Sydney. Residents of Sydney's waterfront slums began to die, and borough councils employed squads of rat hunters. Reports of rats behaving strangely began to circulate in Auckland. In April 1900 Reverend Hugh Kelly preached a sermon on bubonic plague at Auckland's Knox Church. Kelly had grown up in the Presbyterian south of the South Island, before being sent to minister to the souls of the northern city. He warned his audience at Knox church that plagues were 'God's commentary on evil habits of life', that men 'run down by sin' were 'most accessible to plague, and that 'filthy physical habits and filthy moral habits' went together. For Reverend Kelly, it was no coincidence that the latest plague had begun in India, a society 'stricken' by dirt, 'heathenism and vice'. The almighty was using rats and bubonic boils to 'preach' to the Indians. As they watched their kin die, the heathens got 'most impressive proof of the mind of the living god'. Kelly prayed that god would not preach with the plague to the unclean and sinful city of Auckland. When an Auckland newspaper runner was diagnosed with the bubonic plague in May 1900 the rest of New Zealand feared that the disease would spread. Although only a handful of Aucklanders caught the disease, millions of the city's rats became its carriers. An army of bubonic rats mustered in the cellars and drains of central Auckland then, in the early autumn of 1900, began to move south, into the Waikato. Rats stopped traffic, hung like rotten fruit from the orchardists' branches, ate their way through sileage heaps, and climbed the legs of terrifying carthorses. The pack disappeared for a few days, then reemerged, in even larger numbers, on the north bank of the Awakino River, close to the coast of the King Country. The people of Mokau, who lived a few kilometres south of the Awakino, hammered corrugated iron across the windows of their homes and sealed the cracks in their granaries. But by the time the rats reached Mokau they were moving slowly, and without enthusiasm. The animals looked drugged, as they wandered through the town's streets. Soon they began to die in their thousands. The people of Mokau ventured out of their houses, and began to make huge piles of rat corpses. The bubonic plague had killed its carriers. In the first week of October 1913 Wellington's wharfies were locked out of the city's port. Their employers demanded that they submit to arbitration of industrial disputes and put up a bond to cover the cost of future strikes. The wharfies refused, and their comrades in Auckland, Lyttleton, and Port Chalmers staged sympathy strikes. Soon coal miners and seafarers had also folded their arms. At the beginning of November Wellington's wharfies stormed and seized the city's waterfront; their comrades in other port cities threatened to do the same. Massey's Liberal government responded by asking its supporters to volunteer for work as 'special' policemen. In canvas camps farmers were issued with batons and revolvers, as well as hard liquor. Hundreds of 'Massey's cossacks' from the farms of South Auckland massed at Otahuhu, then rode unsteadily to the Waitemata waterfront, where they charged into the ranks of picketers who threw stones and bottles. Businessmen, bank tellers, and students were enlisted as 'foot specials', and joined the battle. Some of the men who volunteered to fight reds in New Zealand's cities had already served together, in the militia that defended the Waikato's white towns from the 'Maori malady'. Cambridge, which had been on the frontline of the war against sick Maori, sent one hundred and thirty-three specials to Auckland. By the end of the year the wharfies had gone back to wharf; the coal miners followed them in January. 'Massey's cossacks' had won. Many of them would soon be fighting together again, in Europe and Turkey. The smallpox epidemic had petered out by the end of 1913, but the restrictions on Maori movement were not dropped until the autumn and winter of 1914. Suspicion of Maori lingered in some communities. When Maori volunteers for the war against the Kaiser camped at the Avondale racecourse late in 1914, locals worried that they might be carrying smallpox. By the time the soldiers were returning and the Kaiser was defeated a new epidemic was spreading through their whanau. Smallpox killed fifty-five New Zealanders, all of them Maori. Influenza would take eight and a half thousand lives, a quarter of them Maori. In 1918, as in 1913, the Great South Road was a vector for infection. Maori villages were once again sealed off, and white militia reappeared. insya allah anda bisa seperti saya…menang togel 275juta, wassalam. insya allah beliau akan membantu anda.Ini benar benar kisah nyata dari saya seorang tki..